Sweetened with organic honey and 20 grams of the highest quality whey protein isolate, Honey Stinger Protein Bars are ideal as recovery bar and as an in between meal snack. Kids also love their protein bars and with 22 essential vitamins and minerals, Honey Stinger is great to include in a pack lunch. INGREDIENTS: Organic Honey; Milk Chocolate [Evaporated Cane Juice, Cocoa Butter, Whole Milk, Chocolate Liquor, Soya Lecithin (an emulsifier), Salt and Vanilla]; Peanut Butter (Dry Roasted Peanuts, Cottonseed and/or Rapeseed Oil, Salt and Citric Acid); Whey Protein Isolate; Vitamins & Minerals [Dicalcium Phosphate, Magnesium Oxide, Ascorbic Acid (Vit C), Alpha-tocopherol Acetate (Vit E), Biotin, Zinc Oxide, Niacin, Ferrous Fumarate (Iron), Molybdenum Glycinate, Calcium Pantothenate, Copper, Manganese, Beta Carotene (Vit A), Selenium, Pyridoxine (B6), Riboflavin (B2), Thiamine (B1), Chromium, Cyanocobolamin (B12), Folic Acid, Potassium Iodide]; Salt. Made with 30% organic ingredients. Made with gluten free ingredients. ALLERGENS: Contains Peanuts, Milk, Soy and Tree Nuts. May Contain, Egg and Wheat. Nutrition facts based on Chocolate Coated Peanut Butta Pro flavor. Facts and ingredients vary by flavor. 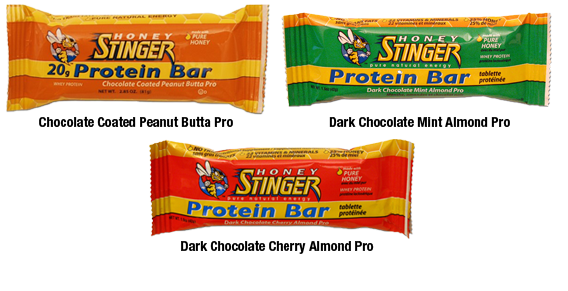 Honey Stinger 20g Protein Bars are a great choice for off season (due to high sugar amount), pre/post workout or as a healthy snack in between meals. It’s a preferred choice for many bikers and runners. Sodium is very low for a 81 gram bar and buyers repeatedly mentioned that it is easy to digest. 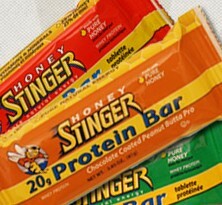 Buyers love the taste of Honey Stinger bars, especially the Peanut Butter flavor. The chocolate coating got good reviews, however it tends to melt fast. Many reviewers mention the delicous candy-bar-like taste that is comparable to a Reese’s Peanut Butter Cup. Outer chocolate has a tendency to melt. Texture is comparable to a 3-Musketeers bar, but smoother. Bikers shouldn’t have a problem to down a bar without stopping. Even though this bar has a lot of sugar, it’s mainly from organic honey, which is a great alternative to white refined sugar. Every bar has 22 vitamins and minerals and some people liked the fact that it doesn’t contain soy. 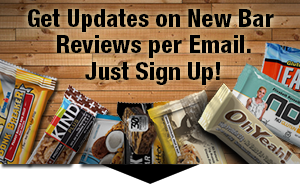 $3 per bar at retail is an average price for a bar that size and with 20g of whey protein. Buyers did not even mention the price in their reviews, so it seems to be fair for what you get. Check out the links below for discounts.